Most of my `ukulele and guitars are special orders, custom made for a specific player. I welcome the customer's input throughout the building process. Typically a dialogue is begun either by e-mail or phone to discuss the proposed instrument. 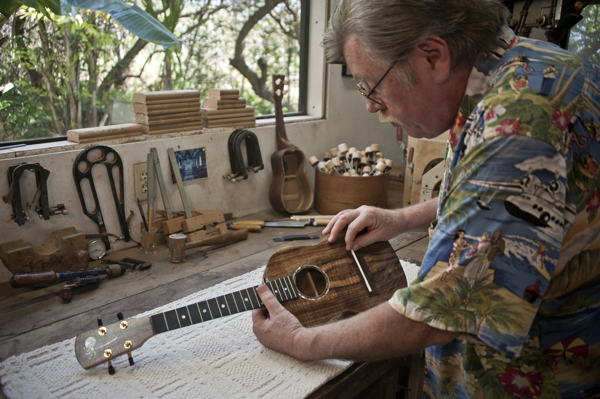 We decide on the size of the `ukulele or guitar, choice of wood, trim, finish, any special inlay wanted and all of the many details that go into building a truly custom instrument. At this point the customer might say “I want a big jazz sound up and down the neck for chord melody” or “I mostly play Hawaiian songs with simple chords and I want an `ukulele that will complement my voice” or “I play Slack Key , but mostly in C and F”. I will always listen and do what I can to make this work. At this point a price will be agreed upon. A non-refundable deposit of $250 for an `Ukulele and $500 for a Guitar will hold your position and guarantee your price. You will be given a time line for construction to begin. I will send a letter for both of us to sign with our agreement outlined. Typically, soon after the deposit is sent we will decide upon wood choice. I usually e-mail photos of 2 or more sets I believe will work best for this particular project but may differ visually - you then may choose. When construction is about to start, ½ of the balance will be due. We will go over all the details and anything can still be changed at this point. You will be given an approximate shipping date, usually 2 to 3 months. You may receive photos during the process if you like. If you need to cancel after this point, what you have paid less the original deposit will be refunded after the instrument is completed and sold. Any special features that need to be changed – your initials in the fingerboard, for instance- and any costs involved in the sale will be reflected in your refund. When all is ready, you pay the balance including your choice of case and shipping. It will be sent fully insured. All payments may be made by credit card, PayPal, check, or wire transfer. Subscribe with me to get the current on news from my shop, Camps and Workshops I will be participating in, and any visits I make to Festivals on the Mainland. Also, any completed instruments that might be available for sale will be featured. I promise your address will not be shared with anyone.